2019 Chaparral 21 H2O Sport. 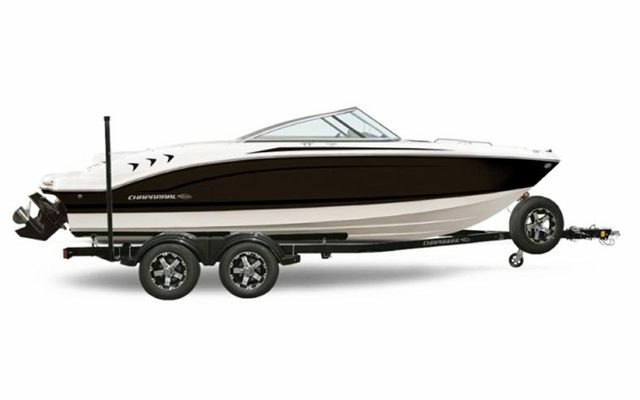 Powered by a 250 hp Mercruiser 4.5L MPI V-6 and packaged with a matching Chaparral tandem axle bunk trailer. Wide band Black hull with Mocha interior. In stock but still shrink wrapped. Photos depict a similar boat but options and colours may vary. Sure the 21 H2O is longer and wider than its popular 19’ little sister, but it’s so much more than that too! Chaparral took the “best in class” features from the 19 H2O and ratcheted it up another notch. The 21’ version also boasts a tandem axle trailer with load guides, a built in anchor locker, an upgraded stereo and contoured upholstery throughout the bow rider seating area just to name a few.